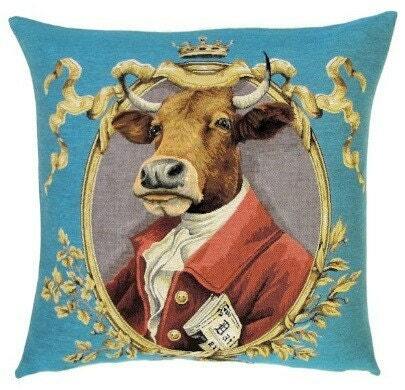 This tapestry cushion is part of a line of three cushions showing farm animals dressed as nobleman. It is designed by co-owner Sabine and is woven on a jacquard loom. Tapestry design is a craft that only a few master and Sabine is one of them. She starts from a high resolution image, which she scans and then comepletely reworks it until it is ready for weaving. Averagely, the "cleaning up" of an image takes between 12 and 16 hours. Respect ! Origin : designed, woven and finished in Belgium ! If you have any more questions, please do not hesitate to contact us. Enjoy your purchase at Yapatkwa ! To fulfil your order, you must provide me with certain information (which you authorized Etsy to provide to me), such as your name, email address, postal address, payment information, and the details of the product that you’re ordering. You may also choose to provide me with additional information (for personalization, for example), if you contact me directly. Do you offer wholesale prices to the trade ? How are sizes indicated ? Absolute great pillow cover! THX a lot! Love it! !